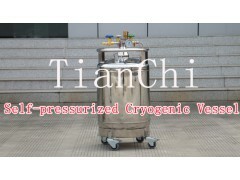 We provide a range of Self-pressurized cryogenic vessels for liquid nitrogen use. This type of dewar uses a valve to divert liquid to a boiling coil inside the vessel, which increases the pressure so that liquid can be forced out. This range is ruggedly built and is ideal for transportation of liquid nitrogen by road.